The author suffered from severe type 2 diabetes for over 20 years. After developing two prediction tools for fasting plasma glucose (FPG) and postprandial glucose (PPG), he was able to reduce his daily glucose from 279 mg/dL to 117 mg/dL, and hemoglobin A1C from 10% to 6.1%. In addition to the primary factors causing his glucose fluctuations, such as medication, carbs and sugar intake, exercise, weight, he also examined other secondary factors, including anxiety, stress, measurement delay, traveling, illness, sleep disturbance, etc. In summary, more than 20 elements were considered and over 1 million data collected. Between 5/2016 and 12/2017, he noticed his glucose fluctuation pattern correlated with the seasonal weather. As a result, he started to investigate the ambient temperature effect. He selected a period of 945 days (6/1/2015-12/31/2017) as his research window. It included three weather periods: 409 days of warm temperature (>77 Fahrenheit); 248 days of mild temperature (67-76 Fahrenheit); and 288 days of cold temperature (<66 Fahrenheit). 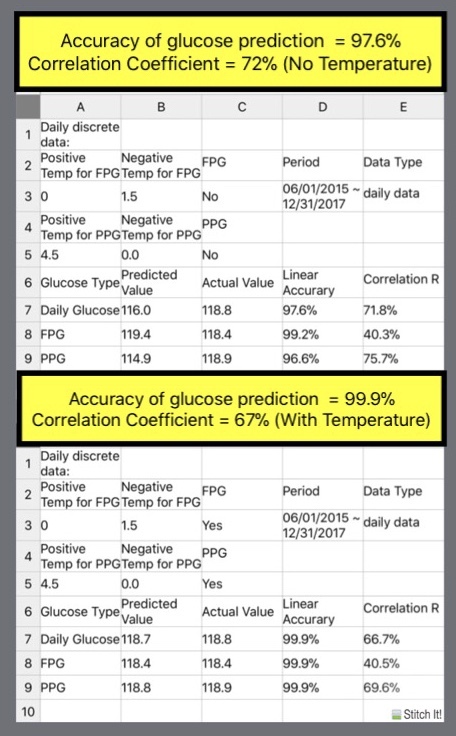 Without ambient temperature considerations, his predicted daily glucose reached to 97.6% linear accuracy rate and 72% correlation. He used a curve-fitting method and different weather formulas. For warm weather, the PPG increased by 0.9 mg/dL for every degree higher than 77 due to increased metabolism activities. For cold weather, the FPG decreased by 0.3 mg/dL for every degree lower than 66 due to “hibernation” effect.